I'll never forget my first administrative job. I was a receptionist and I didn't even have a computer. Just a switchboard to answer the phones and a whole lot of file folders to send out the mail. That was back in 1998 and I've come a long way since. Once you're a receptionist it's an easy transition into the world of administrative assistance. I landed some great jobs and some less than stellar jobs, but one thing was for sure. With every new position, I learned more about more about what it meant to be the kind of administrative assistant that companies wanted to hire. 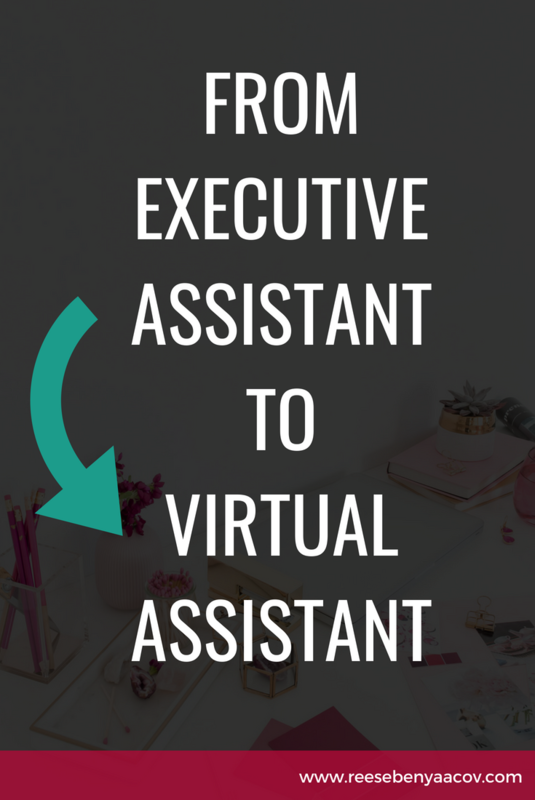 Ready to make the transition and start your own virtual assistant business? Fast forward over a decade later and I was a highly sought-after administrative assistant. I've worked with C-level executives of major corporations - getting the best hands-on education in business you could ever ask for. In an MBA, you learn theory, but there I was getting the best damn business education money can buy because I was learning on the job. I l learned how business really works. In 2005 after moving halfway across the world to Israel, I landed an amazing job working at a fast-paced international venture capital fund supporting two insanely business venture capitalists. To say I loved my job would be an understatement. I absolutely loved supporting busy executives with their day-to-day operations. But just three months into my new job I found myself in a sticky situation, I was pregnant. Don't get me wrong, I was over the moon with excitement about my pregnancy, but I was scared that I'd lose my job. After all, I was only there for a few months so they could let me go as I didn't have tenure. Well, I didn't lose my job. I ended up working for this company for several years. Along the way, I had two more children and with each child I was finding it harder and harder to make things work. I can't tell you how many times I had to call out sick because my kid had a fever. Then there were holidays when there wasn't any childcare BUT it was still a work day. I'd fight with my husband because we both felt our jobs were more important than the other. Who would stay home with the children? Like most traditional men he felt it was my responsibility and I was getting sick and tired of the fights. Thankfully my bosses were amazing and allowed me to work from home. They knew I'd get the job done and I was just thankful that I had the technology to do everything I do in the office from home so I could take care of my children. One day, I was surfing the internet and stumbled upon a job ad for a virtual assistant. I had never heard of a virtual assistant before but suffice to say I had a good idea that it meant an assistant that did work virtually. I immediately applied and had a face-to-face interview with the CEO of this awesome virtual assistant staffing firm based in Israel. They hired me and told me that it could take several weeks before they could match me up with a client. Well, after just 6 weeks I had my first phone interview and I NAILED it. I started working with a financial services firm based in New York City. It was AWESOME. I went to work a 9-5 job every day, came home, spent time with my children and husband and then as soon as the kids went to sleep I got online and started working. Every night for 2-3 hours I worked as a virtual assistant creating travel itineraries for 6 different people. I would write out detail itineraries and upload all the details into their Outlook calendars. I did all of this virtually, from the comfort of my kitchen table (or my bed, where I liked to work sometimes from my laptop).